Discover who snagged the top spots in Computer Arts magazine's prestigious UK studio rankings. 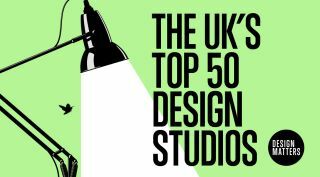 Earlier this year, Computer Arts magazine polled over 80 top creative directors, studio founders and design course leaders from across the UK to discover which industry peers they most revere and respect, to produce its annual UK Top 50 studio rankings. Now in its fourth year, this list is all about peer reputation – regardless of the studios' number of staff, operating budget or awards won. In short, the 50 world-class studios on the list are there because their fellow designers think they should be. Scroll down to see who snagged a spot in this year's rankings – or get your hands on the collectable print edition of Computer Arts magazine 272, which contains the full list. As well as revealing all the winners, this special issue comes with an incredible, glow-in-the-dark cover, designed exclusively by Studio Sutherl&. See how it was printed in the video above. We've been releasing the list of winners bit-by-bit, but can now reveal the last remaining studios: the top 10. Read on to discover who made the cut in the UK’s Top 50 studios 2017, and to read our interviews with the winners. Studio Sutherl& may be tiny, but that doesn’t stop it from creating show-stopping work. It may be relatively new in its current form compared to some of the industry titans on the list, but no-one can doubt the industry experience of its founder, who a fourth panellist described as “the next Alan Fletcher”. What's been your biggest highlight of 2017? Jim Sutherland: Probably the launch of the Somos Brasil project in São Paulo, with Marcus Lyon [highly commended at 2017’s Brand Impact Awards]. It’s a project we’ve been working on for two years, and seeing it appear in Brazil was a delight. Second, running a work(play)shop in Tokyo for D&AD was a surreal and beautiful experience. JS: Controlling the flow of work. I get so excited about the possibilities of lovely projects that I find it hard to say no. What advice would you give to a fellow UK studio to thrive in the face of Brexit uncertainty? JS: Two things: do good work, and everything else will flow from that; only work for people you like, and don’t do it for the money. That’s three things really. I don’t think Brexit will affect my business directly, but it’s an extremely depressing decision. What are your own biggest ambitions for 2018, and how do you plan to achieve them? JS: My ambition is simply to keep doing something that I love. I want to keep collaborating with fantastic people. Finally, how does it feel to be rated the top studio in the country by your peers? JS: It’s amazing. The design industry in this country is full of so many incredibly talented people, so it’s an honour to be among them. Having topped our list in 2016, North fared incredibly strongly once again from the outset, and only Studio Sutherl&’s storming victory could bump the 22-year-old studio into second place. Below, co-founders Sean Perkins and Stephen Gilmore share how their year has gone..
Sean Perkins and Stephen Gilmore: We’ve been lucky enough to work with some great clients, so it’s hard to pick a specific project. But moving into our new studio has been a huge moment for us. SP & SG: It sounds mundane, but coping with the complexity of our over-running studio build, alongside some very demanding projects, made for a challenging year. Thanks to the whole team for getting us all through it. How do you think Brexit may affect your business, and the UK’s global design reputation? SP & SG: Until the outcomes of the Brexit negotiations become clearer, it’s foolish to predict. We try to remain positive. It certainly feels like the UK’s design reputation is as strong as it’s ever been. Any advice for your peers to help it stay that way? SP & SG: Even in tough and uncertain times, please don’t pitch creative work for free. It undermines and demeans us all. What are your own biggest ambitions for 2018? SP & SG: There are a few non-client based projects we’ve wanted to do for a while now. It would be nice to put them out in 2018. North has fared brilliantly in the rankings again. How does it feel? SP & SG: Some great projects have been produced by other studios this year. Honestly, we’re amazed and flattered to get the recognition. Another consistently strong performer in our rankings, ManvsMachine was in second place in 2016, and fourth place in 2015. Like North, the studio – now a part of Landor – was bumped just one place this year. “I consistently adore the work from these guys,” said one panellist. Another called them “mesmerising”, while a third voted them onto the list because of “their absolute lushness”. MvsM is 10 this year. What have you learnt over the past decade? Ellie Bailey: Looking back, the consistency of our output – and the pride we can take in it – is immensely satisfying. We collected a few more awards in 2017, and are larger than at any point in our history, across two studios. It’s an exciting time to take stock and get ready for the next decade. Creating a studio culture like ours requires constant recalibration, ensuring we get the right combination of briefs that answer different needs, enough time for R&D, and access to the creative stimuli we need. Are you concerned about Brexit? EB: Our team is made up of people from all over the world, which we have in common with many studios in London and across the UK. We are better protected than some industries, and prospective staff are all very highly skilled, so we hope it won’t become less attractive for global talent to join us. Uncertainty is so far the worst effect of Brexit, so it’s important to remain calm. The current exchange rate can even be a silver lining – we’re more cost-effective to global clients right now. You’ve kept your top-three spot, that must feel pretty good? EB: The CA audience are industry colleagues at great studios that we admire, so it’s awesome to be recognised in that context. It spurs us to continue producing work that keeps us top of the pile. It’s given us a sense of validation, as we’ve shown off the breadth of our skillset this year – illustrative, procedural, live action, VFX, identity, branding. It’s wonderful that it’s all been so well-received.